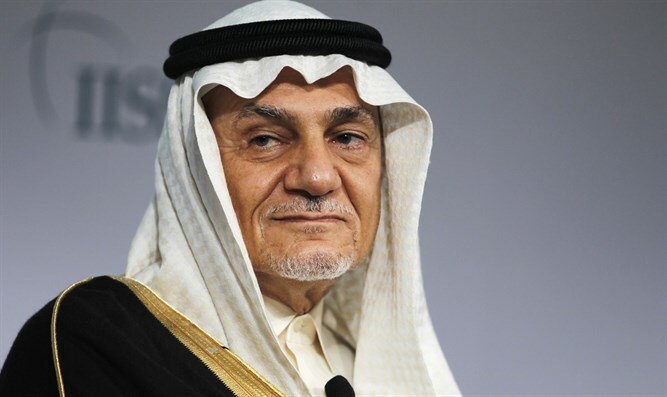 Saudi Prince Turki Al-Faisal tells Channel 13 News relations between Israel and Saudi Arabia can't improve without progress on peace. Saudi Prince Turki Al-Faisal told Channel 13 News in a special interview on Wednesday that Prime Minister Binyamin Netanyahu is deceiving the Israeli public when he claims that relations between Israel and Saudi Arabia can improve without progress in the peace process with the Palestinian Authority. The prince is a senior Saudi royal. He is the nephew of King Salman and cousin of Crown Prince Mohammed bin Salman. He served as head of Saudi intelligence, as Saudi ambassador to London and as Saudi ambassador to Britain. Prince Turki told Channel 13 News that he did not meet with Israelis when he served in official roles because "Israel did not cooperate in attempts to achieve peace." He said that after retiring from his official positions, he met the late President Shimon Peres at a dinner in Davos. "We sat at the same table and Peres suggested that we hold a secret meeting. I told him that nothing in Israel remains secret," the prince said. He noted that despite the fact that he is being interviewed as a private person, he has a message for Israelis on behalf of the Saudi king. Israel to date has rejected the 2002 Saudi proposal due to the fact that it calls for Israel to accept the so-called "right of return" for millions of descendants of Arabs who fled pre-state Israel, effectively bringing an end to the Jewish state. Saudi Foreign Minister Adel al-Jubeir rejected Netanyahu’s demand at the time, arguing that the Arab Peace Initiative is the best solution for the conflict. In Wednesday’s interview with Channel 13 News, Prince Turki expressed pessimism about the possibility of warming of relations between Israel and Saudi Arabia. "I my lifetime – and I do not have a lot left – I do not think I will see a public meeting between an Israeli prime minister and the king or the crown prince of Saudi Arabia. Not before the Palestinian issue is resolved,” said the 73-year-old prince. “I am waiting for an Israeli peace initiative, what Israel thinks needs to be done to achieve peace."